If you want to escape the heavy tourist spots in Iceland, look no further than this scenic inland day trip to the Thjorsardalur Valley, where just a few miles from the popular Golden Circle you’ll find an untouched landscape of waterfalls, rivers and plains near the Hekla volcano. The path isn’t overrun because it’s several miles off the Ring Road (Route 1) and reaching a couple of the main attractions here requires a bit more effort, so you won’t find hordes of buses running through. All you need is a four-wheel drive and a little patience to steer carefully down the bumpy paths that lead off the main, paved road and you’ll be treated to some wonderfully quiet natural attractions. In fact, we saw no more than half a dozen people at any of these stops, and it was mainly the same few travelers on repeat. Scroll down when you’re ready for directions, and check out these three spots where you MUST spend some time on this route. Just off the main road, Hjalparfoss is the easiest site on this list to reach. 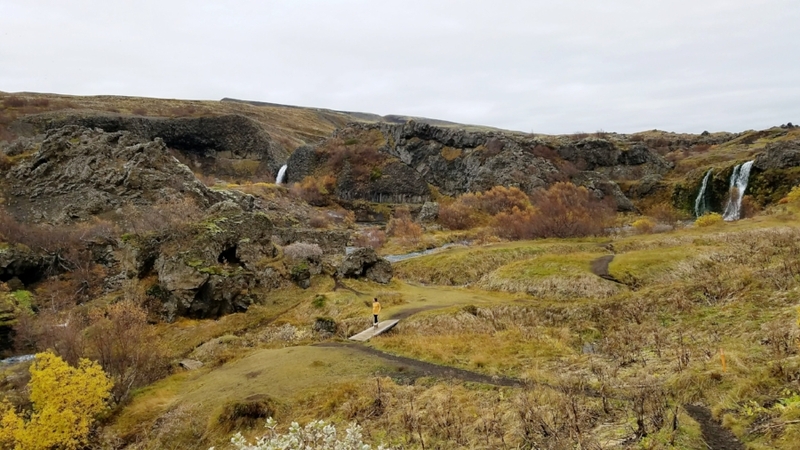 The twin waterfalls here might not be as massive or impressive as some others in the country, but the area is quite scenic, tucked in a valley with hills all around and close to the reconstructed Viking farm of Thjodveldisbaerinn. The falls feed into a round pool with a little wooden dock near the water’s edge. I could almost imagine visiting here on summer weekends if I lived nearby for a swim and a picnic on the quiet shore. Haifoss aptly means “high waterfall,” as it is the third tallest in Iceland. It used to the be the second before the discovery of a glacier waterfall a decade or so ago that bumped it down. Haifoss rings in at about 400 feet, and you can see the whole thing from top to bottom with a visit to the upper rim here. After making your way down a bumpy little road with a whole lot of power lines strung above it, you’ll leave your car in a designated parking lot and walk the rest of the way on rocky paths until you catch a glimpse of Haifoss and her neighboring waterfall, Granni (which literally translates to neighbor). The two flow into a river valley and the craggy canyon walls are pretty cool to look at, too, displaying lots of colors and covered with patches of green moss. You can walk for quite a ways along the rim, looking down the valley to a scenic landscape of rolling hills for miles. Iceland has a lot of big ideas about trolls and fairies – things I generally find to be hogwash (unless I’m at Disney World). Gjain, though, had me singing “I do believe in fairies! I do! I do!” over and over again. This site sits in a valley and driving here along a barren, rocky plain gives no clues about what you’re about to encounter when you walk down the steps into this wonderland. Gjain is a true natural playground, where countless waterfalls flow into pools and streams, some with little wobbly wooden bridges and others you have to rock hop across. There are all sorts of features to explore here, from lava caves and basalt columns to an abundance of flora I could never identify. We visited in fall, when even the ground produced a golden hue, but in summer the valley is covered in lush green. Since there are so many nooks and crannies to check out here, plan to stay for a couple of hours. It was so quiet and peaceful when we went that we never ever wanted to leave. From Reykjavik, drive about 40 miles along the Ring Road to Route 30. You’ll know you’re getting close when you pass through Selfoss, which is a little less than 10 miles from your turn. In another 11 miles, turn again on Route 32 to the right, just past a turn for 31 to the left. Route 32 is the main road for all of the attractions above, so when you get done, you can either come back the same way or continue driving until you reach Route 26, which will take you all the way back down to the Ring Road a little further east near the town of Hella. All of the roads above are paved, it’s only the ones off the beaten track leading to Gjain and Haifoss that you’ll want a 4WD vehicle for. Hjalparfoss is just off the highway and you should see a small sign for it nearly 20 miles from the start of Route 32. For the other two, look for a road labeled 327 for Gjain and 332 for Haifoss, both left-hand turns if you’re heading northeast. Either one will actually get you to both, as they connect. We choose to go to Haifoss first, so we hopped on 332 and then backtracked to 327 to Gjain. Leaving, we followed 327 back to the main road, which turned out to be the bumpiest part of the ride (I swear we went flying off a hill at one point), so you might want to just drive back to 332 to get on 32 if you were able to handle that part. The good thing is, all of these sites show up on the map – just screenshot your route in case you lose service and you should be good to go. Like most paths along the Ring Road, you don’t have a whole lot of options for where to turn, so if you see a road, it’s likely the one you want. If you’re adding this excursion onto a longer road trip in Iceland, you’ll probably want to stay somewhere close so that you’ll have a least half a day for these sites. Before our visit here, we spent the night in the little riverfront town of Hella, where you’ll find a handful of businesses, including a gas station and restaurants. We stayed at Hotel Hella, which had classically designed rooms and an included breakfast with some yummy pastries (read more about it here). Selfoss also is close to this route and is a bigger hub with several options for accommodations. Since Reykjavik only is about 2 hours from the farthest point you’ll drive here, you could also do this as a day trip from the capital city. Use this packing list to figure out what to wear in Iceland.